Forum members appreciate the importance of strengthening a sense of community in our area. I can honestly say all of this involvement has made me much more aware of my locality and the facilities therein and the need for us all to be involved if we are to improve life for all the community. 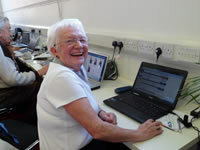 Older people prefer to learn new computer skills in a friendly comfortable environment with people of their own age .. the forum provides drop-in sessions weekly at the local library and at Community House, Derby Road during term time. Our experience in running these have enabled us to play an active part at national level in trying to promote more digial inclusion for older people working with the SUSIT project now nearing the end of its reseach..
Our age group is probably more concerned about litter & graffiti than most, though in a recent survey, one of our members commented that one of the bad things about litter was that it brings criticism of all (young) people when it’s only a few.We have had presentations about flood dangers in our area, and in 2009 our Environment Group was given a tour of local flood defences by Erewash Borough Council. 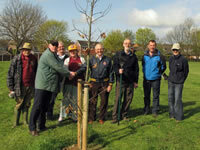 A small group of Forum Eco-Warriors has met with Richard Windsor, Pride in Erewash. We discussed the topics of litter, playground areas and dog-fouling. We had the idea of adding NOW BIN IT labelling to fast food trays.. This area is of primary concern to our age group and members are always keen to learn of new developments and to have the chance to voice their disquiet over shortcomings in local provision. We have been helpful to NHS as they use our meetings to provide information and answer questions about the many changes in local practices including hospital clinics and the provision of health care for the elderly. One of the first suggestions from our forum was to improve help for those too frail to carry out simple but important tasks of maintenance such as changing light bulbs. 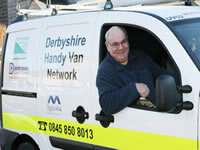 In August 2008, Derbyshire CC rolled out the first of their handy van fleet, a development we much applaud. 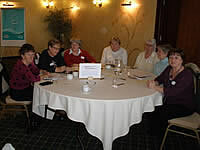 The first topic that the 50plus forum tackled was Crime & The Fear of Crime with an Open Forum meeting on this topic in September 2005. Don't let any doorstep caller past your front door without ID and don't trust any phone calls or e-mails requesting card passwords etc supposedly from a bank or building society. 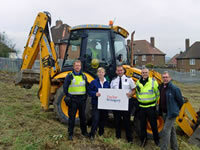 A recent partnership project in Cotmanhay shows how neighbourhood police are trying to help their communities. 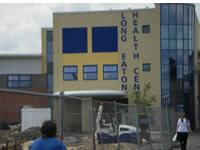 While our membersip extends to the outlying districts of Breaston, Borrowash, Draycott, Sawley & Sandiacre, we all use the facilities provided in the town centre in Long Eaton. We asked members what they liked and what they did not like about the centre. We got some very interesting responses and wrote these up in one of our reports. 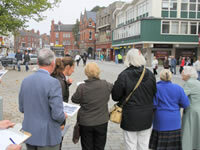 We have a representative from the forum on the Townscape Heritage Initiative Steering Group. Our ideas have helped tp shape how the Lottery Award gained by Erewash Borough Council to upgrade our listed buildings has been spent. Many of our members use local buses regularly and have welcomed the close links we have formed with Trent Barton who run many of our local buses. We have had presentations from the company at two of our meetings. Bus shelter condition has been a campaign for us and we greatly welcome the increased efforts put in since 2007 by the council to try to upgrade our bus shelters and keep them clean. 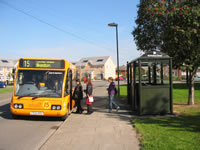 A new bus shelter in Sawley was part of the improvements made in our area. or come to one of our Open Forum meetings. You are also welcome to join one of our support groups whose work is described elsewhere on the site. 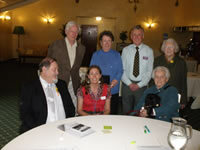 Some of theforum committee with Jo Ellis who is our Forum Support Officer. She is based at County Hall.